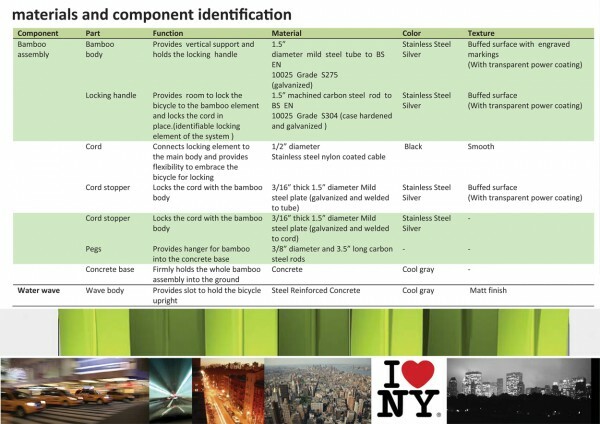 Case Study 06: Oasis in NY, an alternative mobility in megacities. | J. Ricardo Mejía S.
Case Study 06: Oasis in NY, an alternative mobility in megacities. Client: City Racks Design Competition, sponsored by the New York City Department of Transportation, in partnership with the Cooper-Hewitt National Design Museum and the support of Google, Inc. and Transportation Alternative. Design & Engineering team: Patil S., Reyes, O., Heru Prabowo S., and Mejia J.R.
Project date & place: 2008 The Netherlands. Key words: Bicycle rack, Urban furniture, Mobility, Strategic Design, New Product Development. Methods used: Brainstorming and brain-writing. In 1996, the City of New York began installing CityRacks, modeled after similar bicycle racks used in Portland, Seattle, and San Francisco. Two types of CityRacks were installed by the New York City Department of Transportation, the “continuous curve” and the “inverted-U”. The continuous curve four to five bikes and the inverted-U can accommodate two to three. The CityRacks have offered a simple design that blends seamlessly into any New York City neighborhood. 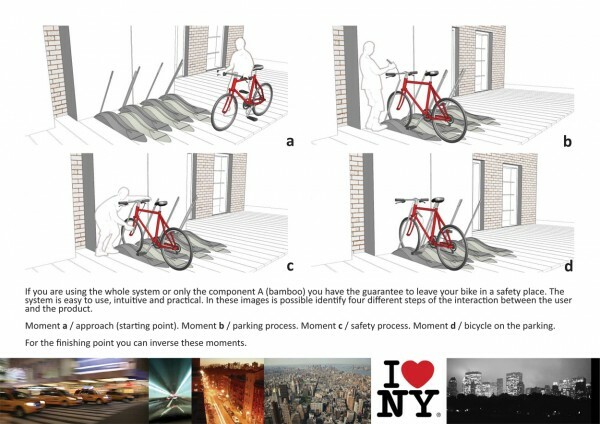 However, after over ten years of use and thousands installed on New York City sidewalks, the City was looking to reinvigorate its bicycle parking and energize its streetscape. With Mayor Michael R. Bloomberg’s ambitious PlaNYC calling for a thirty-percent reduction in greenhouse gases by 2030, shifting more people onto bicycles as a mode of transportation is of paramount importance. To that end, the New York City Department of Transportation in partnership with the Cooper-Hewitt National Design Museum and the support of Google, Inc. and Transportation Alternative called to the City Racks Design Competition. Four students from two different masters of sciences from the Delft University of Technology, have conformed a team to participate in this specific contest. The basic premise behind the concept was that “a bicycle is a steel horse found in the concrete jungles of New York”. Oasis (name and concept of the project) is a place where all these horses (bicycles) can come for rest in a protective environment. 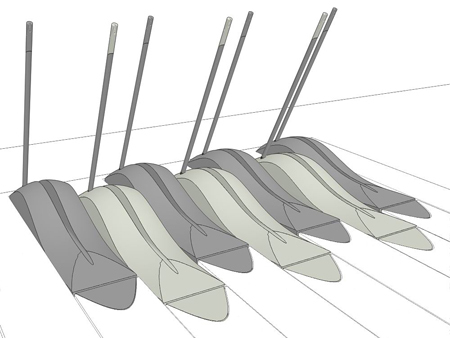 Proposed concept uses the metaphor of an oasis in a desert to embody the concept of bicycle racks. 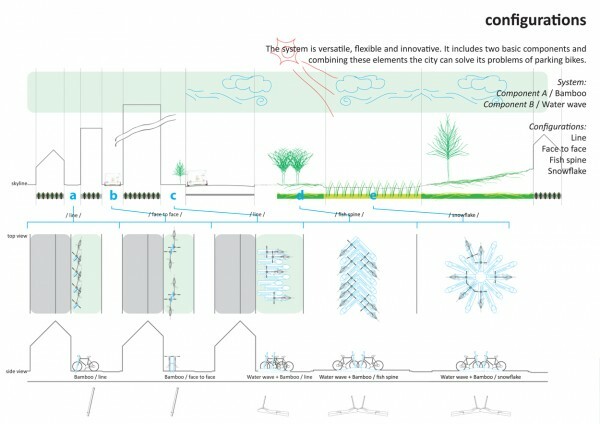 Similar to natural oasis where animals find secure environment for resting, the concept provides a protected environment to park the bicycles in the urban landscape. The elements of the concepts are designed to be appropriate with concrete surrounding and projection of New York. The proposed concept has been developed after meticulous analysis of the context, the typologies, the urban topology and the user experience for the current bicycle racks found in New York. The analysis was followed by a brainstorming session to produce a metaphor for development of different concepts. The concepts were methodically analyzed and a final one was selected for detailing. Oasis consists of two components – Bamboo and a water wave. Bamboo provides the vertical support and security for the bicycle while the wave element supports the front tire so as to keep the bicycle upright. 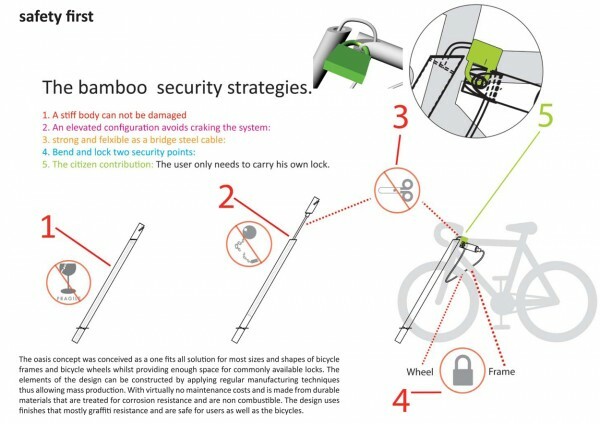 The bamboo also embodies locking and securing features to provide two points of secure contacts. Depending on the landscape the concept can be implemented by using just the bamboo element or the combination of both components creating a module that can be configured in 4 different compositions to fit into the urban landscape characteristics. Based on the landscape the system can be installed in different ways. In the case where only the bamboo element is used the installation process begins with preparation of the ground surface by excavation and by laying of foundation layer. It is followed by installing the bamboo elements by embedding them into concrete to a depth of one foot (or by using the epoxy adhesive in hard terrain). In case where both bamboo and wave elements are being used same installation procedure is used with the exception of the wave element being installed before the bamboo. In case of hard terrain the elements can also be installed by using tamper-resistant concrete expansion anchors.